Reason: For proposing that children who have committed minor crimes, but have stopped breaking the law, should have their record cleared when they turn 18. Lord Carlile – as plain Alex Carlile he was Lib Dem MP for Montgomeryshire before Lembit Opik turned it Tory – is not always the most popular peer among party activists. As the independent reviewer of anti-terrorist laws from 2005-11 he often seemed more concerned with defending the Blair/Brown governments’ authoritarianism than he did British citizens liberties. And his hectoring defence of his friend Lord Rennard, recently forced to apologise following allegations of sexual impropriety against him by four women, did nothing to redeem his reputation. 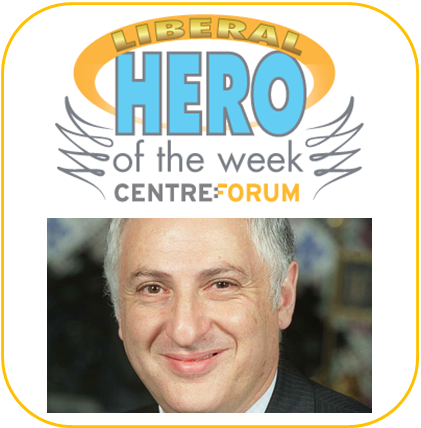 Set against these transgressions, Lord Carlile has often been a liberal hero – for example, his opposition to some of the most egregious cuts to Legal Aid implemented by this Coalition Government. Worth noting, too, that he was the first elected British politician to campaign for the rights of transexual people, when in the mid-1990s he brought forward a Private Members’ Bill proposing a means to correct transsexual people’s birth certificates and status. “What we find is that people whose lives have been reformed – they’ve graduated, they’ve maybe become teachers or lawyers or accountants – are inhibited at obtaining work because CRB checks and other records checks show that they have committed an offence, for example robbery of a mobile phone, when they were 16 years old,” Lord Carlile told the BBC. “And it’s held against them for a very long time. So we think that if people have been through a good criminal justice system, they should be able to wipe the slate clean when they become an adult.” However, he said a “decent time lapse” should be in place when under-18s commit serious offences. Yes, the criminal justice system is there to punish those who do wrong. But, more importantly, it is there to rehabilitate – and when rehabilitation takes place, it should be recognised. In a week when MPs from the Conservative and Labour benches united in support of mandatory jail terms for any adult convicted in England or Wales of a second offence involving a knife – leaving judges with no discretion, no matter what the extenuating circumstances – it is good to see liberal-minded politicians prepared to make a grown-up case for earned second chances.